Chris Morabito (left) earned the win after 6 strong innings while Bryce Eldridge (right) homered and drove in 5 runs in a 12-3 win for the Stars. Photos by Josh Belanger. 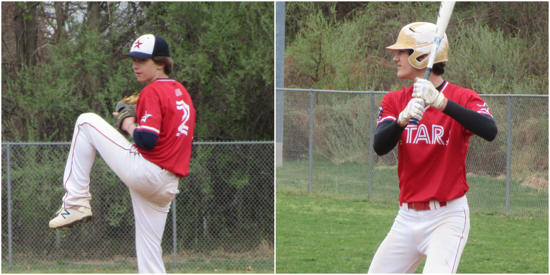 Bryce Eldridge drove in five runs on a 3-for-3 night at the plate while Chris Morabito did not allow an earned run over six innings to lead the Stars Morabito 14u over the MVP Terps Elite 14u, 12-3, last night at Nike Park. Eldridge did not wait long to make his impact on the game, launching a two-run shot in the first inning that clanged off the right-field foul pole. The Stars would follow with two more runs in the inning on a couple of errors by the Terps. In the second, the Stars added four more runs on RBI from Marcus LeClair and Gavin Bartlett and a two-run single from Jakob Luu. Eldridge would tack on one more run in the third on a base hit to give the Stars a commanding 9-0 lead. LeClair and Luu combined for four hits, three RBI and three runs scored as the Stars collected 12 hits in the game. The Stars also ran ramped on the base paths with 10 steals. Terps starter Ryan Sleight lasted just two innings and was relieved by Mike Allen in the third. Allen was a bit more effective, allowing four runs (two earned) over three innings with a pair of strikeouts. Cooper Charneco was the final reliever for the Terps as he was able to retire the side in order in the seventh. On the other side, Morabito appeared locked in from the start. The right-hander shut down the Terps the first time through the order, allowing just a couple of hits. Ryan O’Connor drove in the first run for the Terps in the fourth after Noah Toole reached on a base hit then advanced to third on a two-base throwing error by Morabito. Morabito then retired the side in order in the fifth. The Terps scored in the sixth on a balk by Morabito after Sleight connected on a two-out triple. Despite a number of balks in the game, Morabito commanded the zone and utilized his defense as he recorded just two strikeouts in the game while walking just one batter after the second inning. Hank Lippman come on in relief for the Stars in the seventh and got two quick outs to start the inning, but then allowed a run after a pair of hits from Ryan Halloran and Angelo Jreige before ending the game with a strikeout. Both teams will be off over spring break and will not play again until April 23 when the Stars take on the Bradley Eagles. The Terps will play next against the NOVA Premier on April 24.